In the computer networking framework, load balancing is a technology to distribute workload over two or more servers to prevent web services from being stopped due to the host crash, host repair, operating system upgrade, system switch, etc. It can ensure to provide uninterrupted web services in order to get the optimal resource utilization, maximize throughput, minimize response times and avoid overload. In recent years, the GIS technique has been getting mature at unprecedented speed. The single architecture GIS no longer satisfies the demands of data distribution and data sharing. More and more people expect to conveniently gain the spatial information with the ubiquitous Internet. However, larger quantities of spatial data and more user requests result in over workload which leads to overload of a single host. To solve the problem, the following features make load balancing play an important role in GIS environment. Because of some reasons, like repair, breakdown, software upgrade, or network disconnection, etc., a single server host would stop providing GIS services. 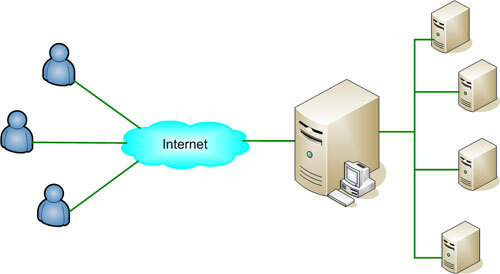 The framework of load balancing can send user requests evenly to the hosts of the server group. Even if one of the hosts can’t work normally due to some reasons, the others still can handle the work to keep GIS services being uninterrupted. Therefore, the availability of server hosts and the usability of GIS services can be effectively enhanced . Scalability is one of the key advantages of load balancing. As there are more and more users, a server would be overloaded with too much work. Thus, the response time would be getting longer, and the performance is lower gradually. The scalability of load balancing allows organizations to add server hosts depending on their needs. When more hosts share users requests, the response time would be reduced effectively and the performance also can be improved. When the servers are old or the requests increase considerably, the servers will be overloaded and incapable of providing sufficient performance. Then, the organizations can add new and more powerful equipments into the server group and adjust the service distribution mode to enhance entire performance by distributing more services to more powerful hosts.